After a quiet introduction to Singapore racing in the final quarter of last year (winning two races), Marc Lerner now figures prominently among the table leaders after a splendid double in two trophy races at Kranji here today. Lerner was unplaced once astride ACROSS THE SEA last year but he made no mistake today when he partnered the Japanese gelding to an easy win in the RDA Cup, a Kranji Stakes C event over 1600m on the polytrack. It was the gelding's sixth win in 46 runs. 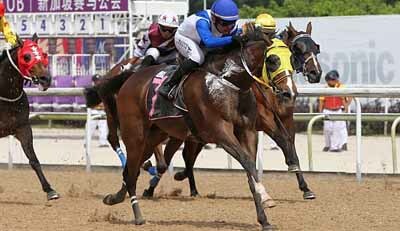 Lerner then captured The British Club Sprint 2019 on INVINCIBLE RYKER who made it two wins in five runs in Singapore. The Irish entire had won three times in 12 starts in Ireland. After his win on ACROSS THE SEA, trainer Hideyuki Takaoha said: "Marc’s improving. He needed the experience with Singapore racing. He’s getting better and I’m very happy for him. I’m also very happy with the good start I’ve made in 2019." Lerner is now fourth in the table with five wins (in six meetings) and Takaoka is third with four winners.